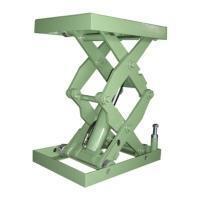 Electric Lift Platform(Table)Type Single-cylinder 2-stage (Load: 500 ~ 2000kg)ELT-205SA~212SA(ELT-205SA~212SA) - Noveltek Industrial Manufacturing Inc.
◆ To reduce the staff bent extract, transport times, physical exertion, to facilitate improved efficiency, materials used in assembly line work, parts of the lift. ◆ The installation of anti-trap device, the staff has been cut to prevent hand-arm clip. ◆ Load factor of safety equipment to improve the body. ◆ Pole maintenance, machine maintenance to protect the staff, maintenance of safety at work. ◆ Yoltage, current, pressure and other parts of the safety factor with a more general type of high. Address: No. 16-1, Shui-Liu-Niang, Shui-Yuan Village Miaoli County, 360 Taiwan, R.O.C.